Well, last weekend I had a few setbacks on the progress on getting the Lady Jane done. I began the day by trying to finish off removing misc hardware and scraping the interior paint. 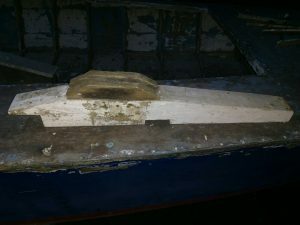 Previously i had limited my paint removal efforts to the bottom of the boat and the areas i nmeeded to to replace the broken ribs. Great progress was made in this task. I also removed all the small splints that were there to back up the garboard seam. This, is where my trouble began. 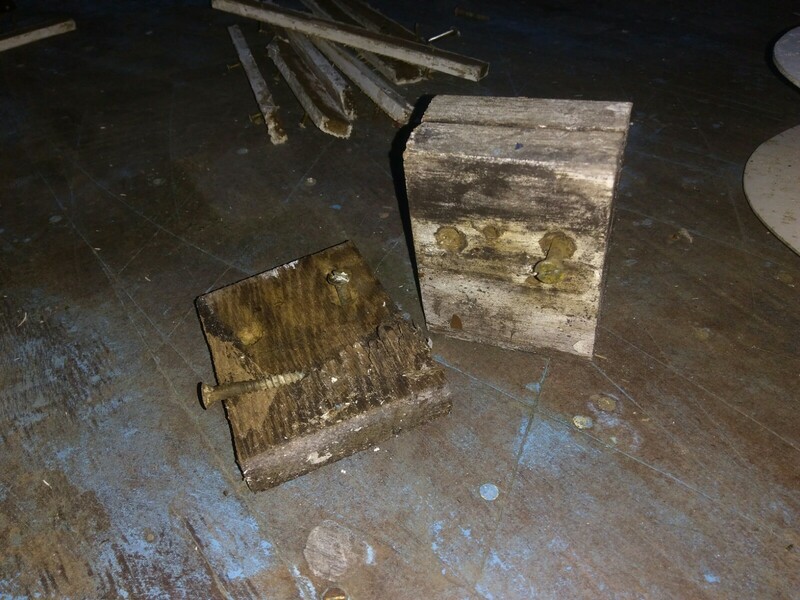 Part of the structure that tied the mast step, deck, and centerboard trunk together needed to be removed to get at the screws holding one of the splints in. I had considered this bracing suspect from the beginning, as it looked sort of half-assed as far as repairs went and it wasn’t tied into the deck in nearly as substantial a manner as I would like to see. Parts of the added wood done as a repair looked like they may have had rot, or at least be susceptible to it. So I removed this bracing. And I discovered that someone had attempted to shim the mast step up by nailing in two one inch pieces to the mast step. Because of this half assed fix, the mast had split part of the mast step. In addition, the mast step wasn’t properly resting on three ribs as designed, it was just notched to clear the middle rib instead of spreading the load to it. So, out came the mast step; to be replaced with new oak. It was then that i discovered the next issue; the rib that had been taking the majority of the force of the rig tension was broken. A previous owner had accomplished the worst attempt at sistering a rib in to the broken one that I had ever seen. 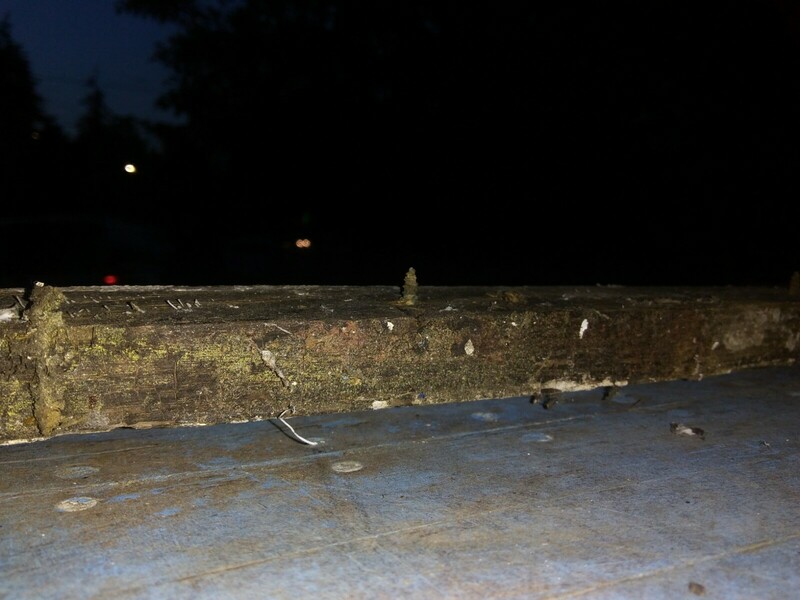 A second rib was glued to the side of the broken one with bathroom tub-grade silocone caulk, and then iron screws had been screwed sideways into the original rib, but only going less than 1/4 inch into it. The new sistered rib had no connection to the hull planking. Less than a half dozen screws like this one shown were installed in a feeble effort to hold the ribs together. This rib just lifted off the original once the step was removed. So, now I also have to attempt to tweak the boat back into the pre-broken rib shape, then make a replacement full width rib. I suspect the shimmed mast step was to make up for the rib under it being cracked in the middle and going into a slightly sharper V when the rig was tensioned. I will probably either make this replacement rib extra thick, or sister a second rib into it to stiffen the hull in this area; it takes alot of tension from the mast and standing rigging. Newer lightings run with far tighter shrouds than these old wooden ones, anyway, so adding stiffness here may be of benefit. It’s a bit disheartening. I need to get this boat done and lately I either seem to be time or resource strapped. The Barefoot Raid is two and a half months away. Speaking of the Barefoot Raid– I may be looking for Crew to go along on this adventure. Send me an email if you’re interested. Ribs are done and I’m beginning to design the cabin.